The weekly sea surface temperature anomalies across the equatorial Pacific for the week centered on April 23, 2014 are elevated, even in the eastern equatorial Pacific, so I thought I’d start the post with a map. 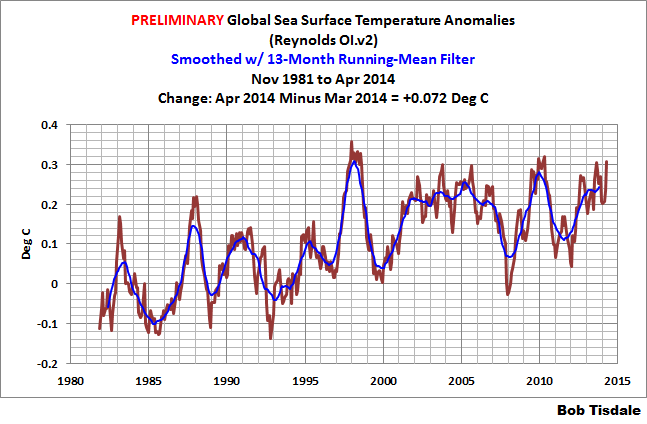 The April 2014 Reynolds OI.v2 Sea Surface Temperature (SST) data through the NOAA NOMADS website won’t be official until Monday, May 5,, 2014. Refer to the schedule on the NOAA Optimum Interpolation Sea Surface Temperature Analysis Frequently Asked Questions webpage. The following are the preliminary Global and NINO3.4 SST anomalies for April 2014 that the NOMADS website prepares based on incomplete data for the month. I’ve also included the weekly data through the week centered on April 23, 2014, but I’ve shortened the span of the weekly data. As noted in the recent mid-April 2013 update, I’ve started using 2001 for the start of the graphs of the weekly data so that the variations can be seen AND so that you can see how “flat” global sea surface temperature anomalies have been since then. The base years for anomalies are 1971-2000, which are the standard base years from the NOAA NOMADS website for this dataset. The preliminary global sea surface temperature anomalies are presently at about +0.31 deg C. Based on the preliminary data, they warm considerably (an increase of about +0.07 deg C) since March. The sea surface temperature anomalies of the NINO3.4 region in the eastern equatorial Pacific (5S-5N, 170W-120W) are a commonly used index for the strength, frequency, and duration of El Niño and La Niña events. See the illustration here for the location of the NINO3.4 region. 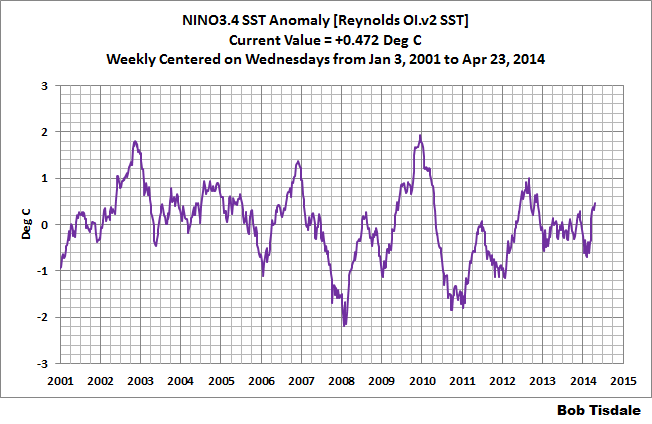 Based on the preliminary data, April 2014 NINO3.4 sea surface temperature anomalies are above zero (about +0.28 deg C), but they have not reached the threshold of an El Niño event. The threshold for an El Niño is considered to be warmer than or equal to +0.5 deg C (and for a La Niña, it’s cooler than or equal to -0.5 deg C). 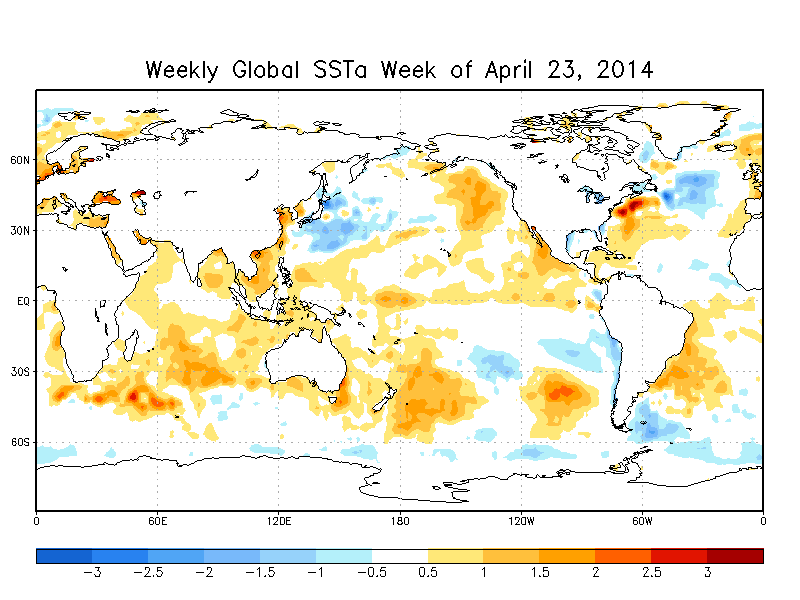 So the reading of +0.28 indicates the tropical Pacific is in ENSO-neutral conditions based on the monthly data. Also refer to the weekly data that follows and shown above, because the weekly NINO3.4 data are very close to the threshold of an El Niño. Weekly NINO3.4 region (5S-5N, 170W-120W) sea surface temperature anomalies for the week centered on April 23, 2014 are above zero and very close El Niño conditions. The weekly NINO3.4 sea surface temperature anomalies were approximately +0.47 deg C.
The weekly Global sea surface temperature anomalies have also warmed recently. They are presently about +0.32 deg C.
Why should you be interested? Sea surface temperature records indicate El Niño and La Niña events are responsible for the warming of global sea surface temperature anomalies over the past 30 years, not manmade greenhouse gases. I’ve searched sea surface temperature records for more than 4 years and ocean heat content records for more than 3 years, and I can find no evidence of an anthropogenic greenhouse gas signal in either dataset. That is, the warming of the global oceans has been caused by naturally occurring, sunlight-fueled, coupled ocean-atmosphere processes, not anthropogenic greenhouse gases. 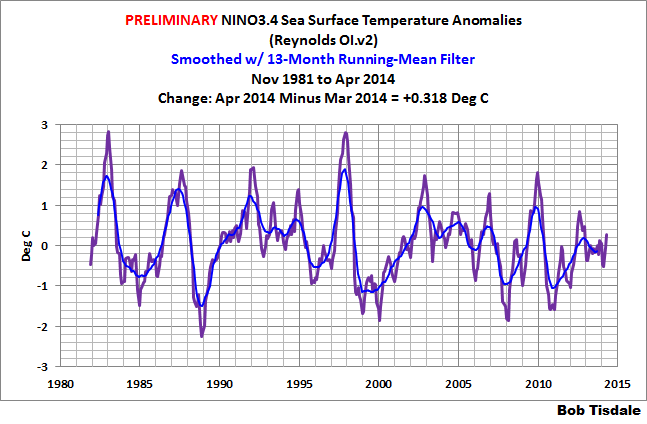 Last year I published an ebook (pdf) about the phenomena called El Niño and La Niña. It’s titled Who Turned on the Heat? with the subtitle The Unsuspected Global Warming Culprit, El Niño Southern Oscillation. It is intended for persons (with or without technical backgrounds) interested in learning about El Niño and La Niña events and in understanding the natural causes of the warming of our global oceans for the past 31+ years. Because land surface air temperatures simply exaggerate the natural warming of the global oceans over annual and multidecadal time periods, the vast majority of the warming taking place on land is natural as well. The book is the product of years of research of the satellite-era sea surface temperature data that’s available to the public via the internet. It presents how the data accounts for its warming—and there are no indications the warming was caused by manmade greenhouse gases. None at all. Who Turned on the Heat? was introduced in the blog post Everything You Ever Wanted to Know about El Niño and La Niña… …Well Just about Everything. The Free Preview includes the Table of Contents; the Introduction; the beginning of Section 1, with the cartoon-like illustrations; the discussion About the Cover; and the Closing. Please buy a copy. (Credit/Debit Card through PayPal. You do NOT have to open a PayPal account. Simply scroll down to the “Don’t Have a PayPal Account” purchase option. It’s only US$8.00 marked down to U.S.$5.00. Thanks, Bob. Very informative post. So, we keep waiting for an El Niño, that is so close to come. We shall see how strong the new kid is, how long will he stay and what the long-term results will be. The next months will be interesting! And if 2015 doesn’t get significantly warmer than 1998, AGW is dead, I’m sure they’ll come up with some new fancy explanations for where the heat went. Hi Bob, what about a post about the SPG? It’s behaviour is very interesting and when we consider a strong link to the AMOC with this in mind: http://www.climate-lab-book.ac.uk/2013/amoc-decline/ let’s have a look to the SST: http://www.dh7fb.de/nao/spgamocgif and also a look to the dynamics…the decrease of 2,27K/20 month is a 3.5 sigma event: http://www.dh7fb.de/nao/spgdyn.gif . 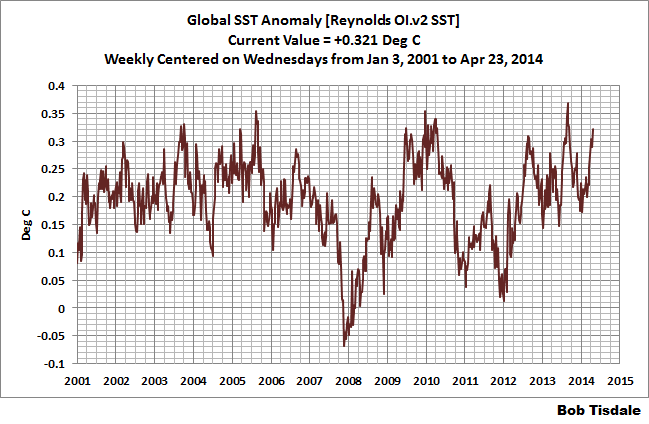 The figure shows the 20 month deltas of SST SPG from 1982 on with the standard deviation of the record. And also remarkable: Was the “up” of 2012 the precursor of the decline of the AMOC? http://www.pik-potsdam.de/~anders/publications/ehlert_levermann14.pdf . Sorry, Frank. I don’t know enough about the subpolar gyre in the North Atlantic to write a reasonable post. Yup, Frank. That’s about it!